In this movie, Rika sings. Surprisingly, that's not the reason this one isn't canon. Strictly speaking, only the second Adventure movie is canon, and only because it was directly referenced in Zero Two. The dub added a few too many inconsistencies to the first movie, while the first entries for Zero Two and Tamers would be difficult to synchronize in each respective series (just because Willis and Kai were proven to exist doesn't mean we have to assume that Davis and Takato had adventures with them in the exotic lands of Colorado and Okinawa). The second movies for these (and, to a much less egregious extent, the Frontier movie) are even more problematic in that they act as though each series did not end the way they did. Why does Revenge of Diaboromon get a pass on this while it's a nagging flaw for Runaway Locomon? For starters, compare the endings of Zero Two and Tamers and tell me which one's more forgivable to ignore. It's also very easy to accept the idea of the Zero Two kids (and only the Zero Two kids) running around with their Digimon in the real world because there was plenty of time in the series where that was the norm. Even though the movie apparently took place after the ending, making it totally wrong, we don't have to make a big adjustment. This movie clearly takes place after the ending, as there was never a point where Kenta and Kazu had partners in the real world, but Jeri didn't (and wasn't catatonic in a pink bubble). That means that for us to accept the reality of this movie, we have to make some very strong presumptions about the meaning of an ambiguous ending. We saw a little data packet offering Takato a glimmer of hope that contact might be re-established... then suddenly all the Digimon are back and hamming it up. We don't even get an emotional reunion; everything's just instantly butterflies and rainbows. No part of the Tamers ending suggests butterflies and rainbows. That's the Zero Two ending. And look how that one turned out. As to the content of the movie itself, it feels like the writers are using this last adventure with the Tamers cast to set these characters free, unchained from all the theme and story and psychology that made the series what it was. There's nothing wrong with a curtain call, but half the movie is spent making sure everybody from Beelzemon to MarineAngemon to Justimon get screentime. Most of the movie's humor is in the way all these players stumble over each other, making the operation twice as difficult, but it's hard to build a decent story around that. Instead, we get Speed 3: Flakes On A Train. A Parasimon possesses a Locomon to chug around Tokyo in order to open a vortex to unleash its brethren. Yamaki comes up with a solution instantly, but Takato and Rika decide to utilize a more hands-on approach, which fails so hard, wastes everybody's time and results in Rika getting possessed herself and attacking Takato with a wrench. Somehow, this is the best part of the movie. It's all worth it to see Rika's daddy issues though, right? The dub does do an exceptional job taking the message of Rika's song and her lip flaps and writing a whole new song around them (it helps that Rika's voice actress can really sing). While it's an interesting peek at her past, it has nothing to do with anything. All we learn is that she misses her daddy... and she doesn't care much for birthday parties. There's no resolution here. While it's amusing to see Takato forced to play her psychiatrist instead of Renamon, it's ultimately Guilmon who knocks her out of it with a well-placed fireball. In the end, she still misses her daddy. Apparently, she also still doesn't care much for birthday parties. 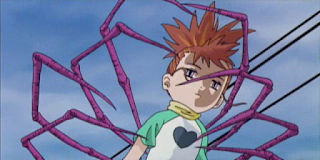 Which is a strange final note to end Digimon Tamers. 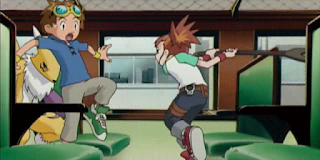 Notice that Takato is trying to keep Guilmon under wraps, yet they spring into action the moment there's trouble afoot... even before discovering that the train's a Digimon. For this movie, Philece Sampler voices Riley. Now, while I don't usually comment on new voice actors who have to fill in for these movies (Jeri, Lopmon and MarineAngemon were also replaced), it amuses me greatly that Riley went from having Yolei's voice actress to Cody's. Yamaki calls Rika in order to talk to Takato, as if he knew they'd be on the train together. Also, despite him designing the algorithm that saved the goddamned world, Rika doesn't trust Yamaki. This is the rug for all those fans pulling for the crazy theory that Yamaki was Rika's dad. It would be pulled later in the movie. When I say that Melissa Fahn can sing, I mean she can sing. Just as Davis did for this series, Rika served as narrator for Frontier. She was replaced towards the end so Fahn could be in Wicked. And when I say “be in Wicked,” I mean she's on the original cast soundtrack. Yamaki ordered modifications to the tracks in order to divert Locomon's path. What he meant was “build an entire new track to link up two separate tracks that didn't originally connect that way, and do it now!” Those builders are the real heroes! But where is the inconsistency with Battle of Adventurer's? The only problem it might have is Omegamon appearing and Mephistomon being a remnant of Apocalymon, and even that sounds more of an aborted crossover movie than a plot hole in itself ,(since there presumably could have been two such digimon in the tamers world, and because there's enough space within the series for it to have taken place within the holidays. Especially considering that it started production right in the beginning of Tamers, so the movie creators probably had a few misconceptions about the story. Same story for the Frontier movie, there's absolutely no reason for we to believe it isn't cannon, even if it wasn't referenced within the series, especially because it could have taken place perfectly within the series, after Takuya and Koji have found their beast spirits and before the final confrontation with the evil legendary warriors or even afterwards, so long as it's before the final fight with Cherubimon. It's impossible to place Battle of Adventurers. Takato, Henry and Rika have Ultimates, so it takes place after Episode 18 and since Calumon's in it, it takes place before Episode 22, but it aired before Rapidmon and Taomon were introduced in the series, and none of them seem worried about the Devas. They need not have to have been ultimate before for them to appear, it's not just some experience level to be unlocked. It's perfectly plausible to think that they digivolved due to the extreme circumstances. Even if they had reached ultimate beforehand, that doesn't mean they would be able do so at every whim, just look at how Renamon had trouble reaching champion even after being Kyubimon once. Even discounting that we do have a clear place in time irrespective of the air date, the summer vacation, meaning that it was before episode 18 and after episode 15. It also helps that neither Henry or Rika were particularly surprised at their partners' ultimate level, even though that was because they had more pressing concerns in their minds. Furthermore, the Tamers had no reason to believe that the movies events had anything to do with the Deva's. Strange digimon, then digimon trying to kidnap humans, then it was revealed to be a human controlling them, then the human turned out to be a digimon trying to rule the world for himself... not of these had anything to do with the Deva's MO, a group of loyal digimon servants of their own god which hates humans. After all why would anyone pretend to be something they hate, just look how the Tamers didn't even suspect Makuramon would disguise himself as a human. I'd like to hear your opinion on this, but I always felt that if you took the general premise of a rogue Locomon causing trouble around the city of Japan it would fit much better in the Frontier universe since that was a main part of that universe. I like it! This would work really well as a post-Frontier movie. The trains are enough of a distinctive element in Frontier that a possessed Trailmon would actually get some sympathy from the audience. But then there wouldn't be an Yamaki working things out like THE boss. The lead Parasimon sounded like a hillbilly. I found this incredibly amusing, for some reason. "only the second Adventure movie is canon"
And the first Adventure movie too. Y'know, with Parrotmon and Greymon? That was CRUCIALLY canon. The first Adventure movie is still very much canon, as it is directly referenced in series, the fact that the dub added in things makes no difference on the canon status of the movie itself, since all it means is that the dub added in things. This is also true for the first Tamers movie, the plot holes were added in by the dub. The 02 movies however, do suffer from plot holes in both its dub and original format, and really don't fit in to the timeline anywhere, even though the first movie was shoe-horned, and yes they do reference the actual events from the movie. The second 02 movie ie Revenge of Diaboromon does fit into the timeline well. Didn't it ever bother anyone else that in all the time Guardromon was with the Tamers, he never re-digivolved to Andromon? Anyone else realized that Xiaochun sang Biggest Dreamer? "It amuses me greatly that Riley went from having Yolei's voice actress to Cody's." Well, I didn't know about Yolei's voice actress being Riley's as well, but in the movie I did comment on how Riley sounded like Cody. I was right after all. But yeah, that IS amusing. Here's my theory. 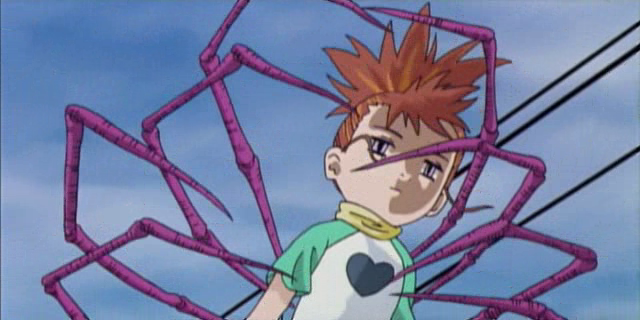 The parasite Digimon dude uses dark memories and stuff for easier control. He really brought some repressed memories of Rika's Dad to the surface and made her confront those feelings again, which is why she's suddenly bringing it up and so melancholy. Also, Rika might not trust Yamaki because he was partially responsible for taking Renamon away from her for an undetermined amount of time. Probably a few months. Wait, isn't Yamaki's solution what enables the invasion in the first place? He puts Parasimon on a beeline for the digital zone, which is exactly what the bug wanted. The question ought to be what the hell would Parasimon have done -without- the man in black. This is one of those Digimon movies that would actually probably be better without the Digimon. The real conflict is Rika working through her trust issues (she actually mistrusts all adults in the Japanese version, not just Yamaki, but the dub missed that) and Takato trying to get her to her own damn birthday party. First Tamers movie is canon. Kai's appearance near the end of the series does prove it in my opinion. Second Adventure 02 movie ie Diaboromon's Counterattack is also apparently canon. It doesn't contradict anything in the series and it fits well in the continuity and in the timeline but it's simply not a terribly important story. The only objection some could raise is some evolutions shown in the movie however that problem, if that's what you want to call it, can be easily solved.